Having just returned from my trip to the IFA Global Press Conference in Malta, I’ll cut to the chase and suggest this to every one of you who is even considering traveling abroad: buy a Oneadaptr Twist World Travel Adapter. Both versions are under $50, and either would make a very thoughtful gift for yourself or your favorite road warrior. 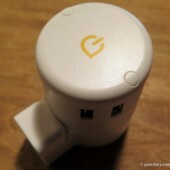 The Twist Plus is available in two models: one includes the world adapter and four USB ports; the other includes the world adapter, four USB ports, and a MacBook charging port. 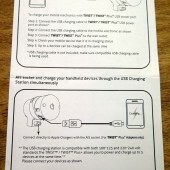 Since I have a 13″ MacBook Pro retina, I requested the version with the MacBook adapter. 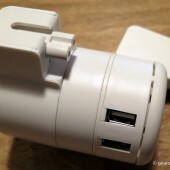 Composed of matte off-white plastic, the Twist Plus World Travel Adapter measures approximately 3.5″ long x 2.25″ wide x 3″ deep. 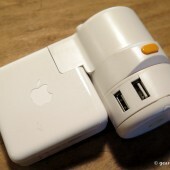 I showed the Twist Plus to a friend while it was plugged into the wall in my hotel room, and she thought it seemed a bit big for what it was; once I explained that it could also charge my MacBook (I just hadn’t plugged the Magsafe power adapter into it yet), her eyes widened in appreciation. 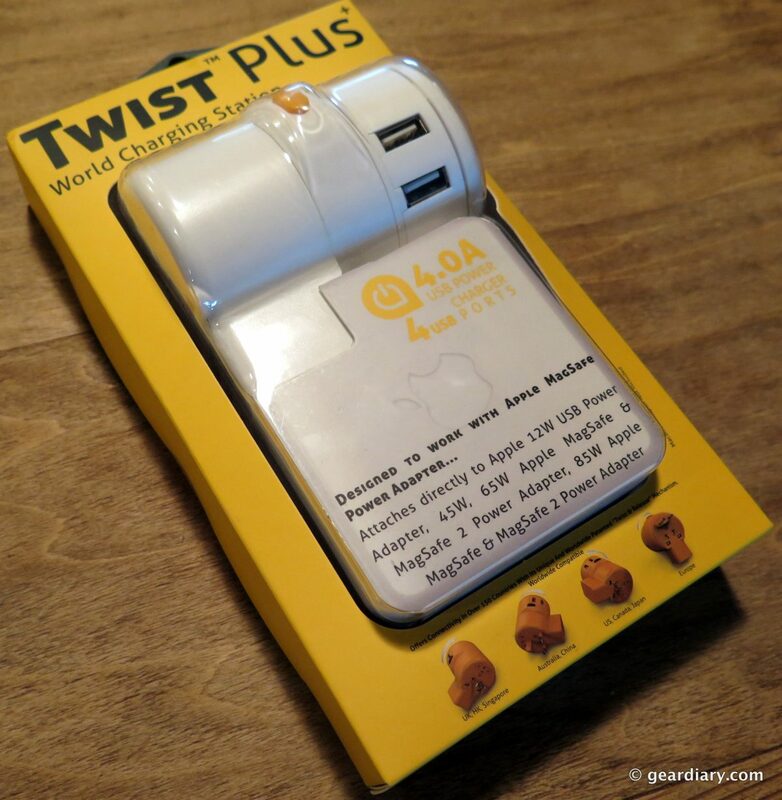 So sure; this is a gadget that will take up a little bit of the spare space in the bottom of your gear bag, but once it’s in there, you can use the Twist Plus World Travel Adapter in 150 countries around the world — including the United States. 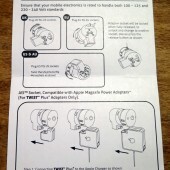 These are the instructions included: everything is very straightforward. 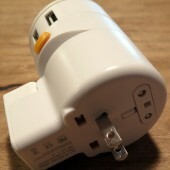 To get the desired plug for your particular country, you press the orange button on the travel adapter’s side, and then you turn the middle section the button is located within until the plug you want is extended. When in transit, you twist to put whatever plug you were using away. If you want to charge your MacBook from the world adapter, you simply remove the plastic plug cover from the Twist Plus’ bottom and attach it to your Magsafe power adapter. 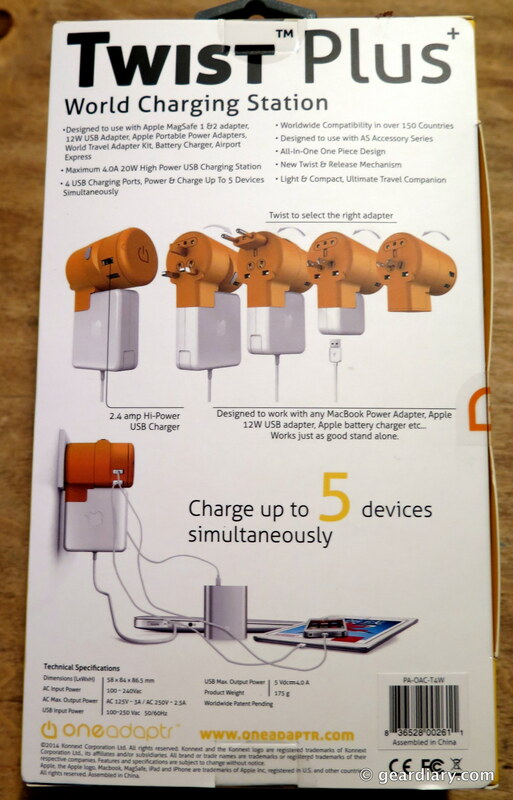 The four USB chargers are evenly divided on each side of the Twist Plus; according to the packaging, the output is a maximum of 4.0 amps. 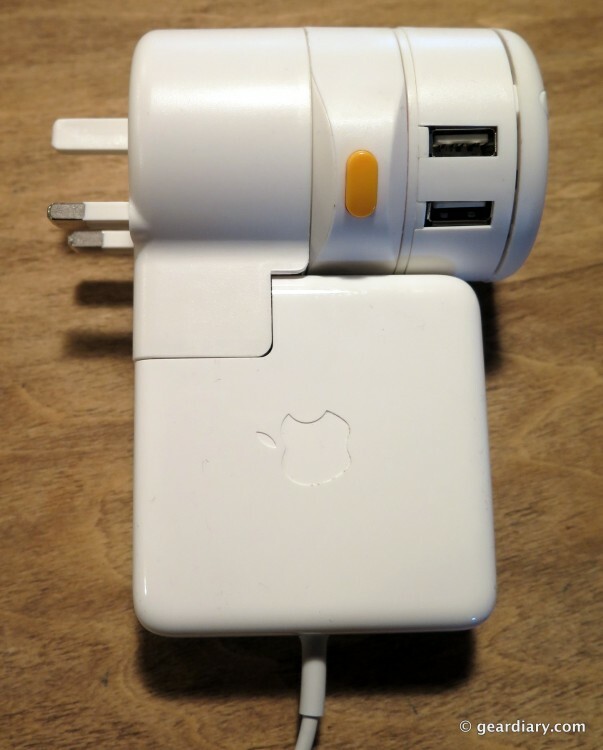 Surprisingly, I never used all four USB ports at the same time, but it seemed that no matter which I used, my iPad or iPhone quickly charged. 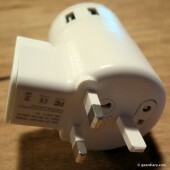 Before leaving for Malta I learned that the country uses the large three-prong UK charger. 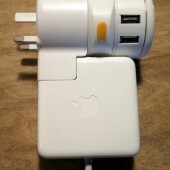 I haven’t traveled to the UK in some time, and all of my travel adapters (other than the Twist Plus) happened to be the two-prong European style. Knowing that I would need at least one separate UK adapter for my curling iron (girly stuff, sorry! 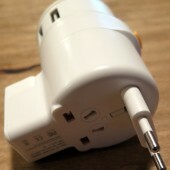 ), I bought a couple of single UK adapters to bring along. Bear with me for a moment, there really is a point to this story. 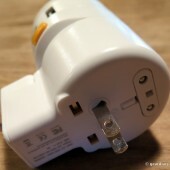 When I got into my hotel room, I found that the only three available plugs in the entire room (and bathroom) were located in a wall inset by the desk, and only one of them was the expected UK version; the other two were the two-prong European style (!!). Of course, I hadn’t brought any of my EU adapters along because everything I read and was told said UK all the way. 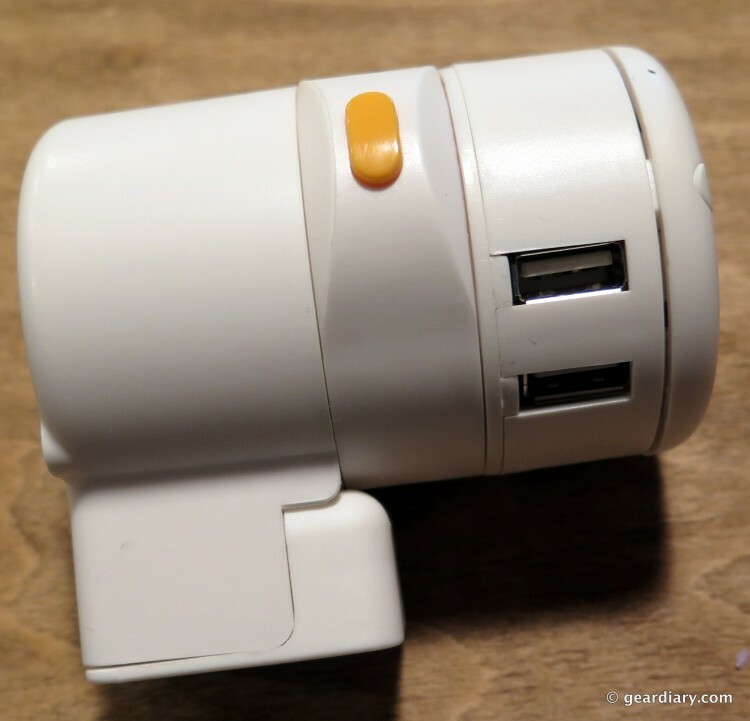 With a simple turn, the Twist Plus World Travel Adapter went from UK to EU; I was set, and a potential international charging disaster was averted. Being able to charge my iPad, phone, and laptop from a single wall port was incredibly convenient — and I still had two spare USB ports! 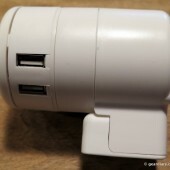 We recently reviewed a similarly priced product that adds a single USB charging port to a MacBook Magsafe power adapter, and before learning about the Twist Plus World Travel Adapter, I would have considered it an excellent option. Now, I’d pass on it and choose this one, because the Twist Plus has everything the other has — and more — in one self-contained package. 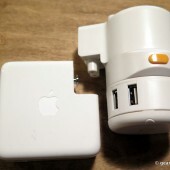 The Oneadaptr Twist World Travel Adapter retails for $44.99 without the MacBook plug or $49.99 with the MacBook plug, and it is available from Bite My Apple. If you are looking for the perfect graduation or Mother’s Day gift for your favorite world traveler, this is it. 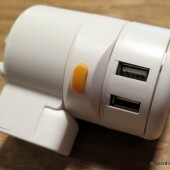 I can’t recommend the Oneadaptr Twist Plus World Travel Adapter highly enough; I’ll never travel without it again.